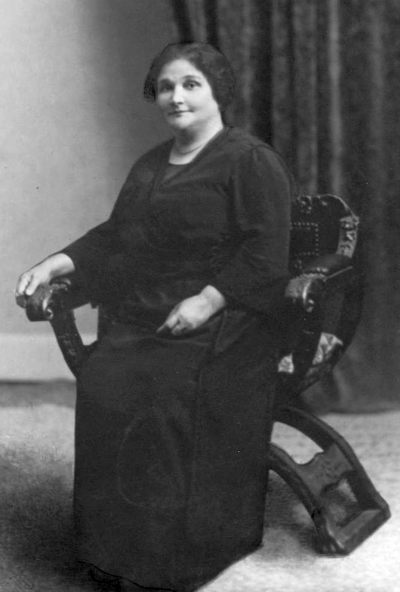 EVA GRIFFIN was born 03 Apr 1870 daughter of Ebenezer Griffin and Mary Ann nee Andrews in St Olave, Surrey London, England. She was given the same name as her sister Eva Griffin who had been born about Dec 1867 in St Olave, London but died 2 years later. The Griffin family immigrated to New Zealand on the sailing ship Mataura arriving at New Plymouth 11 Nov 1875. Her mother Mary died at the end of November 1883 at Huirangi where she was buried. 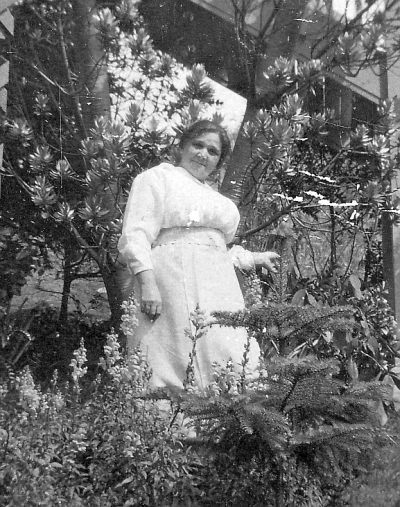 Eva was talented and took an active role in community events at Huirangi where the family settled to farm. Song, Mr. G. Giddy; recitation, Miss E. Griffin; reading, Mrs. Giddy; song ;Miss S. Rowe; recitation, Miss Knight; reading Mr. Andrews; song, Miss O'Leury; recitation, Miss J. Andrews; song, Miss E. Hull recitation, Mr. H. Purdie; recitation, Miss E Griffin; song, Mrs. Rowe; recitation, Miss Knight ; reading, Mr. Campbell; song:, Mr. G. Giddy; recitation, Miss J. Andrews; song, Miss S. Rowe; reading Mr. O'Connell: song:, Miss Hall; recitation, Miss Langman; reading-. Mrs. Giddy; song, Mr. Campbell; song, Miss E. Griffin, reading, Mr. Bluck. At the close of the entertainment the room is cleared for dancing, when the young people enjoyed themselves for a few hours longer, and all went home seemingly well pleased with their evening amusement. 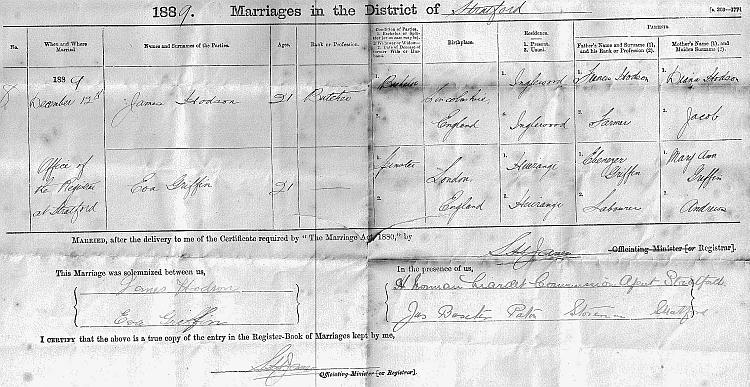 MARRIAGE: HODSON - GRIFFIN. On the 12th inst., at the office of the Registrar, Stratford, James, eldest son of Mr F. Hodson, Tatarainaaka, to Eva, third daughter of Mr E. Griffin, of Huirangi. JAMES HODSON was the first-born son of FRANCIS (FRANK) THOMAS and Diana HODSON and was born 1868 in Lincolnshire, England. 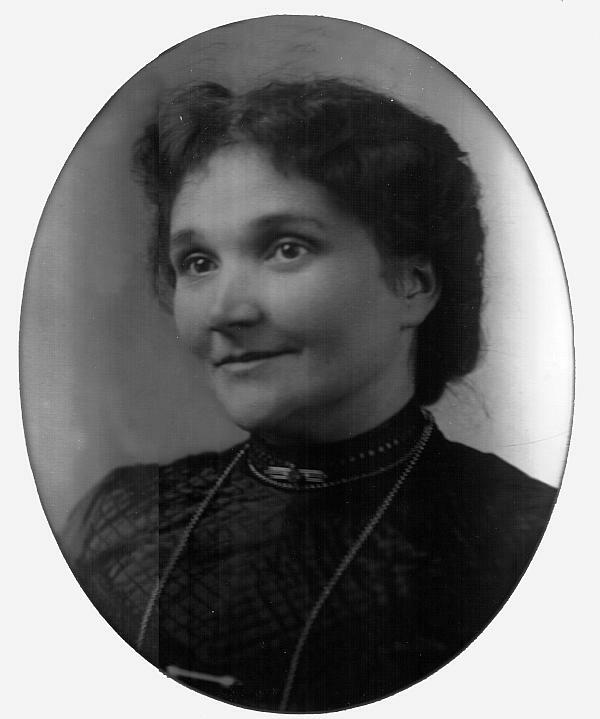 In 1893 Eva noted on the first electoral roll for women; they were living at Ball St, Wanganui. The brothers meeting at Wellington, Mr James placed the state of affairs before Thomas, and it was agreed that an opportunity which would undoubtedly lead to something good then offered. Acting on a happy impulse these young men, coming to Wanganui, leased the London Bakery on the River Bank and commenced business. So great was the outcry against the "staff of life" then supplied that Mr James Hodson, who has always acted as the outside representative, had no difficulty in at once securing 70 customers for a start, housewives imagining that matters at all events could not be deteriorated. That the experience gained by the professional brother of the firm in the different centres where he had learnt his business and afterwards prosecuted his trade was not altogether of a mediocre sort is verified by the fact that within 18 months the business has increased from 70 customers to 240. Within the last few months, finding that the old bakery was not quite up to requirements, the brothers purchased a quarter-acre faction in Niblett Street and commenced to build what is now known as the Plymouth Bakery. An innovation in this establishment is that the oven which is accounted one of the best here, and capable of holding a batch of 340 loaves, is built in, that is, ' that instead of the back of the oven being exposed to wind and weather, it is sided and roofed in and contained in a building 72 feet by 14 feet. This building is divided into the bake-house, a store room and stabling; and a shed. The bakehouse in addition to the oven contains the usual appliances of a bakery, that is, the troughs for the mixing of dough, of which there are two capacious ones, and the kneading and moulding table. And here also, the store room not having the capacity, about 10 tons of flour of southern manufacture, the best for such purposes, and of all the approved brands, find room. The store room is occupied by sacks upon sacks of flour, too, and adjoining the store room is the stable furnishing room for a couple of serviceable horses which are looked after in a better manner than many a human being. In continuation is a coach shed which holds two substantial and cleanly looking bread carts, and business is so much on the increase that room will very shortly have to be found for a third. Two thousand six hundred loaves a week are baked by the Hodson Bros., and this, despite the fact that the firm has only been in existence 18 months, and that there are numerous other bakers in town, puts the hall mar on the article produced at the Plymouth Bakery. Twice a week the Messrs Hodson produce currant loaves which are growing daily in greater demand. Not having a shop in town, they yet go in for the manufacture of small goods and employ one man specially for this branch of the trade. These small goods are delivered twice a week at the houses of customers. Five hands arc constantly employed, and amongst the customers of the firm are the Girls' College and several other large public places. Mr James Hodson, of the "Plymouth" Bakery, has decided to bake, in addition to the ordinary loaf, the extract of malt bread. This is recommended every where by the medical profession as the most wholesome bread, and should meet with a ready demand. Orders left with the "Plymouth " Bakery will be promptly attended to. 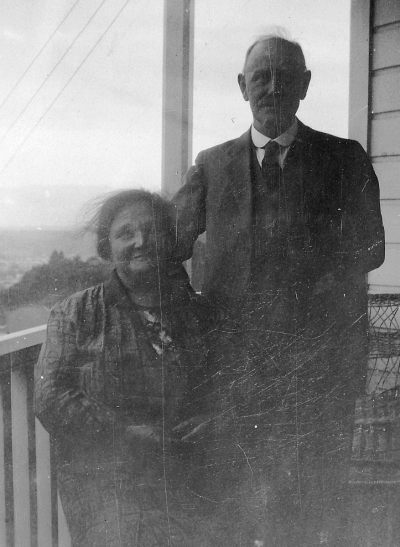 On the 24 June 1898 at the Wanganui Hospital, Eva's father Ebenezer Griffin died, aged 62 years. 1900 Wanganui Herald, 18 December: BUSINESS NOTES: Mr James Hodson, baker, confectioner, grocer, and general storckeeper, at the corner of Guyton and Bell Streets, takes the opportunity of thanking his customes of past favours, and, at the same time, wishing them the compliments of the season. Attention is drawn to the consignment just to hand of new season's fruits for the festive season, also a splendid stock of prime hams and bacon, together with a choice assortment of table delicacies and cordials of all descriptions, crockeryware, etc. The bread manufactured by Mr James Hodson is of the finest quality, delivered to any part of the town or country ; a speciality is made of Christmas and New Year cakes, and there is a fine variety in small goods, such as cakes, biscuits, lollies, etc. Catering is carried out in a thoroughly capable manner, and in this connection it may ba mentioned that Mr Hodson has the catering for the Friendly Societies' picnic at Matarawa on New Year's Day. In wishing his many customers and friends the compliments of the season, Mr T. Hodson, baker, confectioner, and caterer, of the Avenue (opposito the Catholic Church), notifies that, as in the past, it will be his aim to supply everything of the best at his refreshment-rooms and on the very shortest notice. Particular mention may be made of the ice creams, iced drinks, cakea, biscuits, confectionery, and Christmas and New Year cakes, one of tho specialities of the establishment. Mr T. Hodson is well known, as the caterer for the Wanganui Jockey Club, and in undertaking to cater for balls, parties, wedding breakfasts, etc., states that every engagement made is carried out under his direct supervision. 1901 Wanganui Herald, 14 February 1901: JAMES HODSON BAKER AND CONFECTIONER, GROCER, AND GENERAL STOREKEEPER, Takes this opportunity of wishing his numerous customers THE COMPLIMENTS OF THE SEASON, and also of thanking them for past favours, and hopes by strict attention to business to merit a continuance of the same in future. GROCERIES. GROCERIES. He desires to draw attention to his very fine consignment of NEW SEASON'S FRUITS, consisting of CURRANTS, SULTANAS, RAISINS, ALMONDS. FIGS, MUSCATELS, PRUNES, Etc., Etc. Also, NEW DRIED FRUITS for the Xmas Season, and a lot of CALIFORNIAN CANNED FRUITS of the Best Brands. He has just opened up a Splendid Stock of PRIME HAMS, PRIME BACON, and a very choice assortment of TABLE DELICACIES and CORDIALS of all descriptions. CROCKERY. "Sets of Jugs, Sugar Basins, Jam and Butter Dishes, Fancy Cups and Saucers, Small Crockery Cruets, Dinner Sets, Teapots, etc., all suitable for Christmas Presents. BREAD of the FINEST QUALITY delivered to any part of the town or Country. XMAS and NEW YEAR CAKEs, WEDDING and CHRISTENING CAKES a Speciality. SMALL GOODS,. SMALL GOODS. Cakes, Biscuits, and Lollies. CATERING DONE. Families Waited on Daily. JAMES HODSON, STORE Corner of Guyton and Bell Street*. Telephone 183. BAKERY Niblett Street. Telephone 272.Mr Hodson has also a splendid stock of groceries, which he is selling at the lowest possible prices. (Source Cyclopedia) The Silver Grid Dining and Supper Rooms was established in 1903 by James Hodson in Victoria Avenue, Wanganui. There was a large general dining room and a private dining room for ladies -together having a seating capacity for seventy persons. 1903, 30 October: "The Silver Grid". CHANGE OF PROPRIETORSHIP. JAMES HODSON begs to notify having taken over the above well-known Dining Rooms, from the Ist May. He trusts by having EVERYTHING UP-TO-DATE, and keeping a first-class Spread, to still merit the support of all old patrons and the general public. PRIVATE LUNCHEONS, DINNERS, or SUPPERS served on the premises -if required. ' ' GRILLS,, FLOUNDERS, and OYSTERS .will be served as before. 2 January 1904: OWING to the other branches of my business taking up so much of my time, I have decided to CLOSE my Store at the corner of Bell and Guyton Streets. All Accounts owing must be paid on or before the 10th January. JAMES HODSON, SILVER GRID, AVENUE. 1907 Wanganui Herald, 24 July: Mr James Hodson desires us to state that there is no truth in the rumour circulated to the effect that he is giving up the Silver Grid Dining Booms. His business has grown to such an extent, however, that he has found it necessary to provide more acommodation for the travelling public, and with this end in, view a large and commodious building is being erected for him in Ridgway Street, to be known as the Parkville Private Hotel. The building will be built and furnished on the most up-to-date lines, and the travelling public will be able to depend on receiving the very best attention. Mr Hodson expects the new building to be ready about the middle of November. 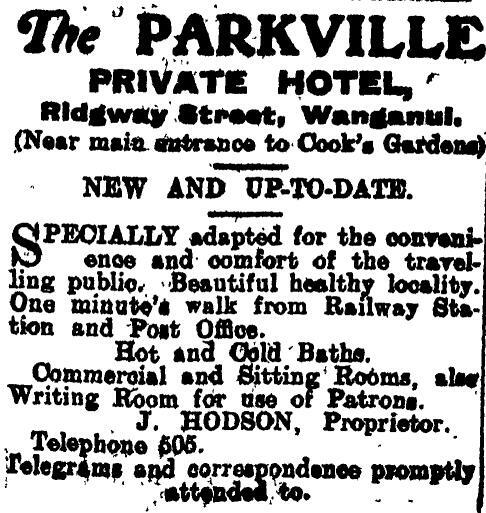 Hotels and Boarding Houses - The Parkville Private Hotel (J. Hodson, proprietor), Ridgway Street, Wanganui. (page 610) This hotel is a fine two-storeyed brick building, with ornamental wooden facings and a balcony, and has a frontage of sixty-four feet to Ridgway Street. The front entrance is by large doublefolding doors opening into a fine hall, twenty feet by sixteen feet. This leads to a well-appointed dining-room, measuring thirty-four feet by forty-four feet, with accommodation for seventy guests. The remainder of the ground floor is occupied by the commercial room (which measures sixteen feet by twenty feet), a writing room, the manager's office, and accommodation for the proprietor and his staff. A broad staircase leads to the upper apartments, which include a private sitting room for ladies, a well-furnished general sitting room, bedrooms, bathrooms (with hot and cold water laid on), and lavatories. The building is lighted by gas, and there are two large three-burner incandescent are lamps on the outside of the hotel. Practically all the comforts and conveniences of civilisation are found in this well-appointed hotel, and fire-escape ladders have been placed in readiness to ensure the safety of guests. A good table is kept, and the tariff is moderate. James Hodson's Tea rooms offered various Wanganui clubs a venue for their meeting - eg Coursing Club are "reminded of the meeting to be held to-night-at Hodson's (Carlton) Tea Rooms at 7.30 o'clock; ST. MARY'S CLUB. Members are reminded of the euchre tournament which is to eventuate on Wednesday next, with the representatives of the Bishop Lodge of Druids, at Hodson's rooms; HOCKEY. A general meeting of members and intending members 'of the recently-formed Federal Hockey Club will be held on Tuesday night in Hodson's tea rooms. 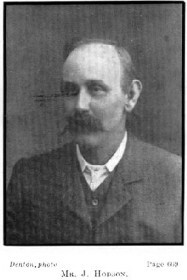 Report: In March 1909, James and brothers Thomas and George Hodson, farewelled their father Mr Frank Hodson who left by the express train for Wellington en route for the Old Country, on a holiday trip to see his father. Mr Frank Hodson has just sold his farm near New Plymouth, where he has resided for the last 34 years, and intends returning to the Dominion to live in retirement. Last night the members of the family residing in Wanganui met with a number of friends to wish the old gentleman bon voyage. 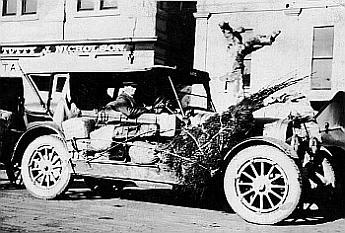 In May 1917 entrepreneur James Hodson, the proprietor of Wanganui's "Parkville Private Hotel", entered the road passenger transport industry . The Hodsons now lived at Durie Hill, Wanganui. These wonderful family photos depict James Hodson's vision in setting up Wanganui passenger transport. They were sent by David Leitch, his grandson. David says, in a dictionary they were stamped "Hodson Pioneer Motor Services Ltd" and his mother told him "Aard" meant "world wide" however reference to Dutch and Afrikaans' sources indicate that it means "nature". 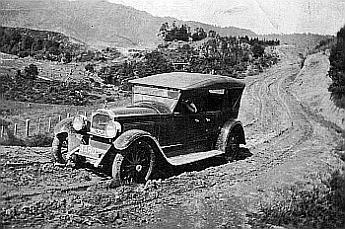 Additional links Bus and Coach Association (NZ) and then scroll down for Wikipedia "Passenger Services"
1938 Obituary Wanganui Chronical: The death 20 Oct 1938 has occured after an illness which lasted four years of Mrs James Hodson, of Wanganui. The deceased lady was loved and respected by many people in different parts of New Zealand. She had a likeable nature and many endearing and human qualities, which made for her many friends. 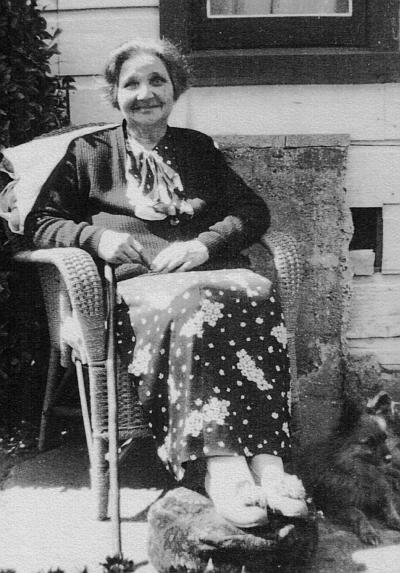 Eva aged 68 years, was buried at the Aramoho Cemetery, Wanganui. 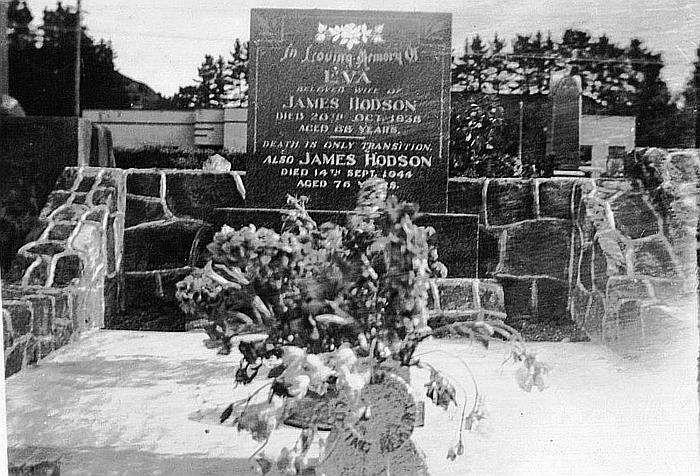 On 14th September 1944, James Hodson, hotelkeeper (his probate states "taxi driver") passed away after a life of endeavour, aged 76 years and was buried with Eva, his wife of 49 years, at Aramoho.